Pepe Gancedo was the architect behind the Golf del Sur complex when it first opened in 1987, around the same time that the Amarilla golf course was built and both golf facilities now sit close to each other, near the busy Reina Sofia airport on the south coast of Teneife. Golf del Sur consists of three loops of nine holes – the North, South and Links. Each nine consists of two par threes, two par fives and five par fours, measuring between 3,100 and 3,300 yards, so any of the three 18-hole combinations are never too demanding in terms of yardage – ideal for holiday golf. 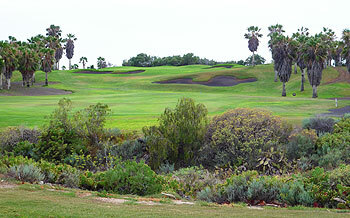 Surrounded by holiday apartments and located close to the coast, the del Sur golf complex has moved with the times to retain its share of golfing trade in a very competitive market – Manuel Pinero was involved in some recent remodeling work, updating holes 3, 4 and 5 on the Links in 2005 and landscaping the 3rd on the North the following year. Black volcanic sand bunkers provide an interesting and unforgettable contrast against the lush green playing surfaces. Palm trees and prickly cacti are dotted here and there, but it’s the testing greens and the fickle Atlantic winds that make Golf del Sur so thoroughly engaging. Las Americas and Adeje courses opened in 1998, doubling the number of courses in the southern tourist trap of Tenerife in one fell swoop. Together with the up-market Abama resort which opened in 2005, the five courses in this part of the island offer resident and visiting golfers a fantastic choice of playing facility. I played Golf Del Sur a couple of times recently on a Tenerife golf trip, managed to play all 3 loops during a couple of rounds. It is an attractive looking course with the lush green frequently framed by black sand (although often more like gravel!) and the conditioning of both fairways and greens was good. Personally I feel the North and South are the best of the 27 holes, the links feels compromised by the land they had to squeeze the holes into and with hazards rather clumsily added giving it an unnatural feel. It is generous from the tee and a solid challenge even from the yellows, the key defence the course has is the wind which seems to always blow hard from the airport and it sure makes the course a great deal tougher. On one of the days we played it was blowing 15 mph+, will little natural cover it made the round something of a grind. One really disappointing element was the pace of play, 5 hour+ rounds seem the norm and the club doesn't seem to do much to control the standard of golfers or have marshals out to speed up play, given it was low season I can't imagine how long a round takes during the peak months. Personally I rate Adeje and Las Americas higher than Gold Del Sur. Having played all 3 nines of this course recently I have to say I am surprised at its ranking. For me having played over 50 courses in spain I am surprised that this is ranked as highly as it is. We enjoyed the course and found it good fun, but we were slightly underwhelmed. If I compare this to Montecastillo that we played a few years ago, and at the time of writing this is ranked one place below Golf Del Sur I would say they are poles apart in quality in favour of Montecastillo. I would say that this was okay to play the greens were good and true and there are nice holes. I would also thank the course for keeping us as a two ball not always the case in Spain. For me this is an average course and a 3 ranking for average. I have been playing Golf del Sur on average twice a year for the last 5 years and I find the course and the staff to be excellent. Its not a Major venue by any stretch of the imagination but its great holiday golf. That's not to say its not a test, as its usually breezy and therefore a challenge. Split in to 3 nines, Links, North and South, the main view is that the South is the sterner test with the Links being the easier of the 3 courses. There are some great holes and some real risk and reward holes, with the 4th on the North a hit the fairway or reload kind of hole! After playing the bar and restaurant provide good food and drink and is an ideal spot to end the round. Paco in the pro shop is excellent and regripped my full set of clubs for a really competitive price too! I played this course in December. On one side it is a really challenging course with some pretty though and hilly holes. On the other side it is slicing paradise because of the wide fairways. The course is in fine condition and the facilities are up to date. I was not really impressed by the lay-out (up and down) and the environment (many holiday apartments and construction areas). Overall I enjoyed playing here very much (23 degrees celcius in the middle of the winter) and I would recommend everybody to play here while on holiday on Tenerife. I’ve just watched a re-run on television of the 1995 “Shell’s Wonderful World of Golf” match between Ernie Els and Phil Mickelson at del Sur - what a late winter’s night treat that was! Many may disparage the type of relaxing, holiday golf to be found on the Canary Islands but neither of those fresh faced young men from 15 years ago managed to tear the course up – Phil, in fact, finished a couple over par, four shots behind the Big Easy! It certainly whetted my appetite for a return to Tenerife in a couple of months when I’ll almost certainly manage another 27 holes here. Disclaimer: I do NOT work for the Canary Islands tourist board NOR am I an employee of the Golf del Sur club. I DO however enjoy playing on decent tracks with the sun on my back and this is one place that fits the bill superbly. Until the arrival of Abama in 2005, Golf del Sur was, in my opinion, the best course in Tenerife. It’s still a cut above the others, of course, and many golfers will tell you that it continues to offer the best value golf on the island. The Links course has recently been extended to a par of 36 (with back-to-back par fives on holes 3 and 4) so any combination of the three nines will give a par of 72 for an 18-hole round. The North course has a great run of holes starting at the 2nd and ending at the 7th where water protects the front of the green but it’s the South course that really steals the show at Golf del Sur. The par three 2nd is played slightly downhill to an island green completely surrounded by black volcanic sand, the 4th is played to a wonderful, elevated green site then holes 5, 7 and 8 incorporate the natural lie of the land to great effect, forcing carries across barrancas (ravines) to the putting surfaces. At a push, I’d say play the North and South if you only have time for an 18 hole round but you really should make the time to play all three nines in order to decide which two make up your favourite Golf del Sur 18-holes.